Vanessa Rene, a business-savvy brunette is perhaps a bit too smart for her own good. Her intuitive suspicions have all too often been both correct and dangerous. Most recently, she has uncovered reasons to believe that her own place of employment, Bookwald Industries, is meddling in some adverse affairs. She has discovered links to the war in Gazth-Sonika in addition to the highly covert intelligence organization known as Enfant. This time, she may have dug too deep. 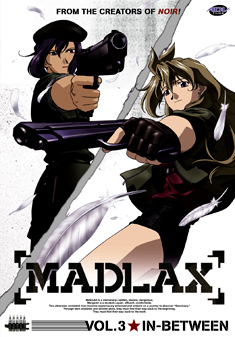 Madlax may be her only hope. Contains episodes 9-12 of the anime series.